Nose, Turbinate - Hyperostosis in a male B6C3F1/N mouse from a chronic study. Thickening of the turbinate bone is present. 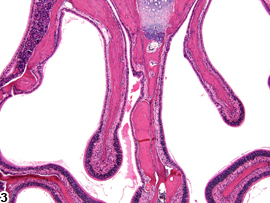 Nose, Turbinate - Hyperostosis in a male B6C3F1/N mouse from a chronic study (higher magnification of Figure 1). 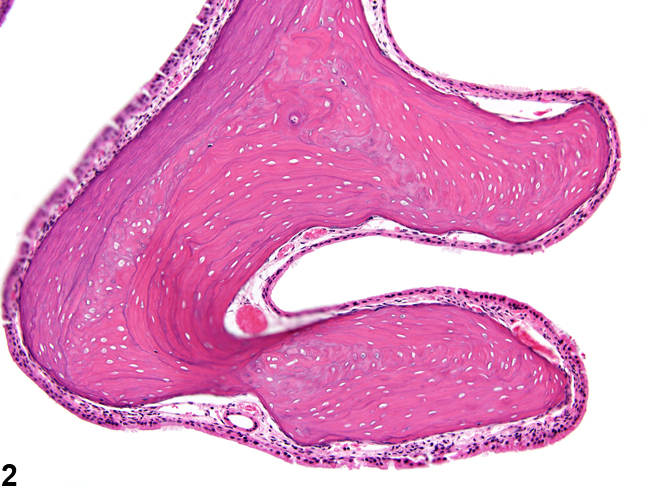 Numerous empty lacunae and reversal lines are present in the thickened turbinate bone. Nose, Turbinate - Hyperostosis in a male B6C3F1/N mouse from a chronic study. In addition to turbinate bone thickening, there is thickening of the bone in the nasal septum and atrophy of the olfactory mucosa. 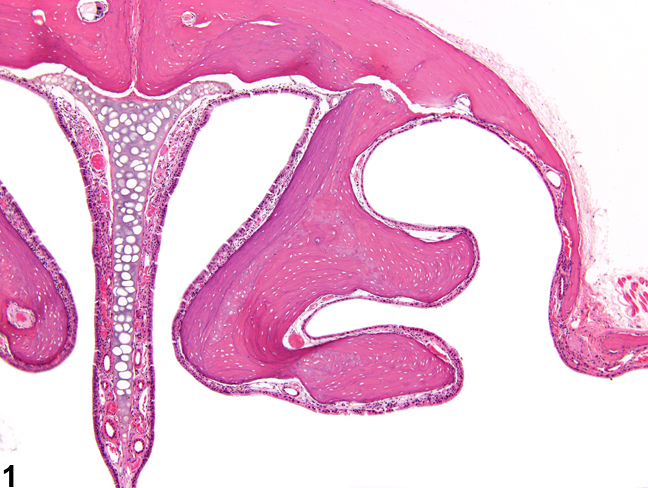 Nose, Turbinate - Hyperostosis in a male F344/N rat from a chronic study. There is atrophy of some turbinates (arrows) and hyperostosis of others. Hyperostosis is an increase in the amount of bone resulting in a thickened anatomic structure ( Figure 1 , Figure 2 , Figure 3 , and Figure 4 ). Hyperostosis may be a systemic condition, and thickening of the bones of the skull may also be present. 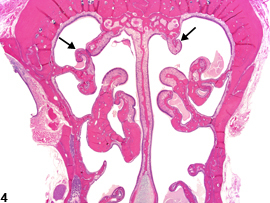 In the nose, it is often associated with atrophy of the nasal mucosa and is more commonly seen in turbinate bone, but it also occurs in the nasal septum ( Figure 3 ). The proposed pathogenesis involves decreased bone resorption due to impaired osteoclast function. In some cases, there may be atrophy of some turbinates and hyperostosis of others ( Figure 4 ). Hyperostosis should be diagnosed whenever present and assigned a severity grade. All accompanying lesions, such as inflammation, turbinate atrophy, and olfactory epithelial atrophy, should be diagnosed separately. National Toxicology Program. 1982. NTP TR-228. Carcinogenesis Bioassay of Vinylidene Chloride (CAS No. 75-35-4) in F344 Rats and B6C3F1 Mice (Gavage Study). NTP, Research Triangle Park, NC. National Toxicology Program. 2011. NTP TR-566. Toxicology and Carcinogenesis Studies of Diethylamine (CAS No. 109-89-7) in F344/N Rats and B6C3F1 Mice (Inhalation Studies). NTP, Research Triangle Park, NC.